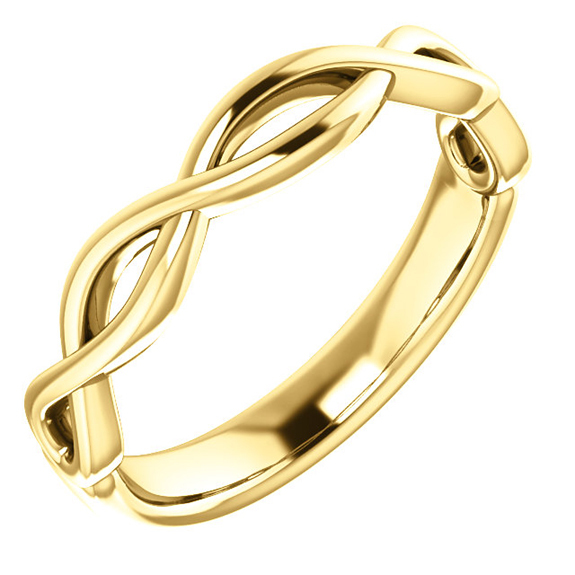 The warm hue of 14K yellow gold meets with a loving symbol to create Apples of Gold Jewelry's lovely infinity wedding band ring for women in 14K gold. A beautiful wedding band ring for couples who love to show their constant love for each other, the inifnity symbols on the ring wrap around the front and sides of the band, giving a peek-a-boo look that is sure to melt your heart. With a width of 3.59mm, the ring is available in your choice of 14K or 18K yellow gold. We guarantee our Infinity Wedding Band Ring for Women in 14K Gold to be high quality, authentic jewelry, as described above.